A sleek contemporary villa with sea views and heated infinity pool. Occupying a supremely panoramic position and looking out over vast swathes of Puglia’s Adriatic coastline, Villa Eterea offers refined living in a peaceful setting, one restaurant within walking distance and both beaches and numerous charming towns close at hand. Inside: accommodation at Villa Eterea is spread over three floors. The main entrance takes one into the welcoming living room which offers stunning views and sliding glass doors opening onto a terrace that runs along the entire façade of the villa To one side, the living area's local pietra di Trani stone flooring flows into the dining room, which features a contemporary fireplace and more glass sliding doors that bring in the sensational views and lead out onto a covered section of the terrace. A short corridor leads from the dining room to the modern kitchen, whose top-notch appliances exemplify the level of quality in furnishings and fittings that you find throughout the house. Back in the living room, a corridor leads along the front of the house, off which are two double-twin bedrooms, each with its own en-suite shower room. The third bedroom, a double, is found at the end of the corridor and boasts wonderful sea views, sliding glass doors accessing the main terrace and an en-suite bathroom with designer tub and shower attachment. The fourth bedroom, a double with en-suite shower room, is accessed via a narrow staircase from the corridor in between the kitchen and the dining room and has the added bonus of a large, enchantingly panoramic roof terrace. Accommodation at Villa Eterea is completed by a fifth double bedroom with en-suite bathroom and a small gym, on the lower ground floor. These rooms are accessed independently from the pool area and not connected internally to the floors above. 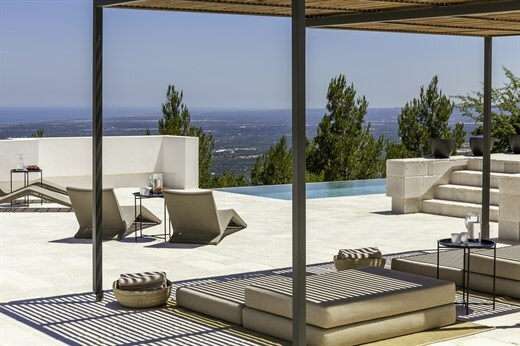 Outside: al fresco life at Villa Eterea is focuses around two main areas, both of which are blessed with magnificent bird's-eye vistas that take in the town of Fasano below, acre upon acre of olive grove, the sparkling Adriatic Sea and, in the distance, the towns of Ostuni and Brindisi. The first is a large terrace running along the entire façade of the house, accessed from a variety of points (the living and dining rooms, the corridor and one of the bedrooms). A large covered section of this terrace is furnished for dining, sitting and reclining. To one side steps lead down to the second outdoor space: the fabulous pool area. Pride of place is given to the enticing heated infinity pool that really takes advantage of its unbeatable position. Surrounding it on three sides is a wide expanse of terrace with a variety of sun-drenched and sun-kissed areas. To one side of this area, doors access the fifth bedroom and the gym. Last, though by no means least, is the roof terrace, the icing on the cake for guests staying in the top bedroom. Villa Eterea features a fantastic infinity pool, offering swimmers stunning views while in the pool. There is a drop from the infinity edge so we recommend children are supervised at all times. Please refer to our general safety page if you would like more information about infinity pools. Villa Eterea sits just outside the charming village of Selva di Fasano on the eastern flanks of the Valle d'Itria. Far below is the town of Fasano and a plain of olive groves that runs for dozens of kilometres along Puglia's Adriatic coastline. Apart from Selva di Fasano, the nearest town for shopping, restaurants and other amenities is Fasano. Most of your sight-seeing will centre on wonderful towns of the Valle d'Itria: Alberobello (a UNESCO Heritage Site thanks to its wonderful trulli-laden centre), Cisterino, Locorotondo, Martina Franca and Ostuni. All offer plenty to see, regular markets, as well as a good selection of bars, shops, restaurants and trattorie. One of the attractions of Villa Eterea is undoubtedly that guests may reach beautiful beach clubs, golf courses and spas nearby. World class sites a little further afield include the Baroque centre of Lecce and the stunning walled coastal towns of Otranto and Gallipoli. For golf enthusiasts, Villa Eterea is only 6km (a mere 15-minute drive) away from the 18-hole golf course of Savelletri. "Villa Eterea is a special home, lovingly cared for by a wonderful owner. It is beautiful beyond what is conveyed by the website pictures... everything in the house was perfect." The host was especially welcoming and helpful. Villa Eterea was spectacular and the owner could not do enough for us. Bravo! We loved Villa Eterea and had a fab time. Villa Eterea was phenomenal with everything we needed. We loved the quality and liked the attention we received from the attentive owner. Villa Eterea was stunning and the amenities were wonderful- well stocked kitchen, comfortable linens and sheets etc.. I would absolutely return to the villa and recommend to other friends and family. Villa Eterea was amazing. Excellent service. First rate place. We had an amazing stay at Villa Eterea, thank you. The owner took good care of us. Villa Eterea was the best villa we have ever stayed in! We loved our holiday. Villa Eterea is an excellent property - one of the best that we have stayed at and the service provided by the owner was outstanding. Villa Eterea is a special home and attended to and lovingly cared for by a wonderful owner, his wife and their 'master' homemaker. The home is beautiful beyond what is conveyed by the website pictures, and the owners and staff worked tirelessly to ensure everything in the house was perfect. We befriended them, adored them and miss them all. Our holiday? We were delighted in every way. From initiating an email correspondence with London to the day we left the villa, everything was handled professionally and with care. This was truly an excellent experience and I would not hesitate to use TTT again or recommend them to friends. Villa Eterea is a very relaxing set up. We enjoyed the tranquillity. The house was immaculate. Oh my! Amazing! Villa Eterea is spectacular. It is equipped like a five star hotel, very comfortable - luxurious. It is an ideal location for an adult group since there are many areas outside to relax while maintaining privacy. The views are so beautiful. The owners were gracious, friendly and welcoming. We felt like family. Villa Eterea was exceptional. My friends and I all thought that the property was first class in terms of setting, grounds, view and facilities. We love the villa. I think perhaps the photos on your site didn't do full justice to Villa Eterea. What we most enjoyed about Puglia? Our villa and the food. I stayed here in June along with nine family members of differing ages as my son was getting married in Conversano. Both the villa and the views are simply stunning. Such attention to detail, we wanted for nothing. The room safes, slippers, toiletries etc made it feel like a private hotel. The owner is just lovely and couldn’t have been more helpful as too was his wife. Their staff were impeccable. We had family visiting and arranged a dinner at the villa for twelve. The food, wine and service couldn’t be faulted. I can’t recommend Villa Eterea highly enough. I just wanted to let you know how wonderful our time at Villa Eterea was. Just amazing. A beautiful house and you quickly feel like home. We wouldn't have expected such a wonderful place. The architecture, the furniture, the equipment, the decoration, simply everything. Fresh flowers in all the rooms. Amazing! A wonderful letter from the host and a very friendly, generous hospitality. It will be a pleasure for all future guests at Villa Eterea to spend their time there. It was outstanding. Fantastisches Haus, sehr gute Köchin. Alles war ganz wundervoll, die elegante Leichtigkeit der Villa, das atemberaubende Panorama, die herzlichen Gastgeber Cesare und Emma, die sich rührend um uns gekümmert haben. Also abermals: großes Kompliment – und vielen Dank für alles!